The air is finally cooling, the leaves are just barely beginning to change colors, and farmers markets are chock full of amazing fall produce, including almost sugary sweet corn. The hot summer and monsoon-like rains have wreaked havoc on some of the market produce, but the corn has been amazing. 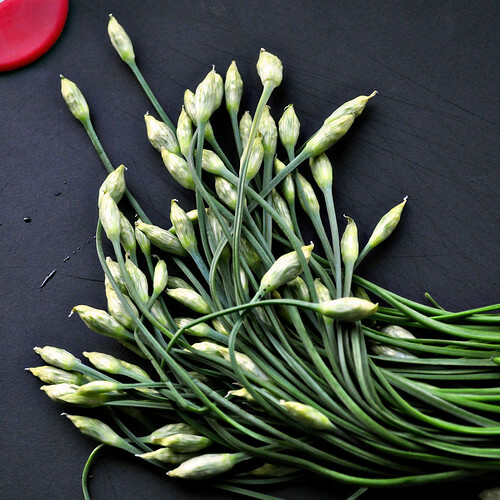 I've been visiting different farmers markets over the last few weekends and on my last trip out I found a small table covered in beautiful chives, complete with lovely chive blossoms. 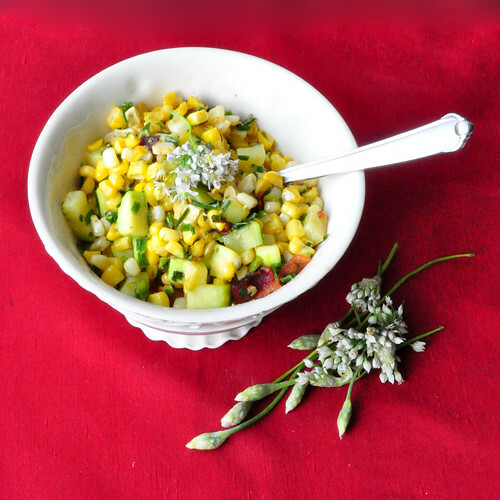 I scooped up the bunch, a small handful of mint and a few ears of corn and I lugged them home to make this recipe, which I'd bookmarked from The Kitchn a few weeks back. Now I don't know about you, but I find that shaving corn is always a messy process in my kitchen. I know that there are fancy shmancy corn shavers out there, but I just don't think that they deserve valuable drawer space in my kitchen, so I improvise. I usually pick out a nice wide bowl, put an inverted glass into the middle of that, stand my corn on the glass and use my knife to shave the kernels off. That way the bowl catches 98% of the flying kernels and the mess is at a minimum. Adding zucchini boosts up the veggie appeal and a few pieces of bacon adds a great smokey flavor, making for a great side dish. - Place the diced zucchini in a colander or small bowl and sprinkle lightly with salt. Set aside. - Heat a deep skillet over medium heat and fry the bacon strips until crispy. Remove the bacon, crumble and set aside. Pour off some of the grease, leaving about a tablespoon or two in the pan. 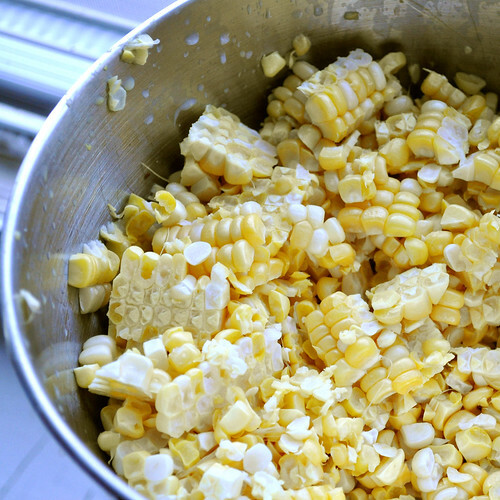 Add the corn kernels and cook over medium heat, stirring frequently, until they are tender or about 5 minutes. - Drain any excess water off the zucchini (I didn't have very much liquid, but you might) and add to the skillet, along with the chives and mint. Sauté just until the zucchini is barely tender or about 3 minutes. - Remove from the heat, stir in the crumbled bacon and season to taste with salt and pepper. Serve immediately while hot, or at room temperature. I love the top picture.